A table with a canvas-covered top and a roller that can travel across it; used for flattening clay into sheets of even thickness. On this one, the thickness can be adjusted by adding or removing canvas covered boards under the roller. Using a slab roller is not rocket science, but there are a few things to watch out for. Wipe the canvas clean after each use, so you don't get dry bits embedded in your slabs, and also to minimize dust issues (otherwise adding and removing boards can be an unhealthy proposition). Just like rolling out dough or clay with a rolling pin, the roller will only stretch the clay in the direction it travels - the clay will get longer, but not wider. It's a good idea to pound the clay out (like making a flour tortilla) until it's as wide as you want it, and not any thinner than you want at the edges. 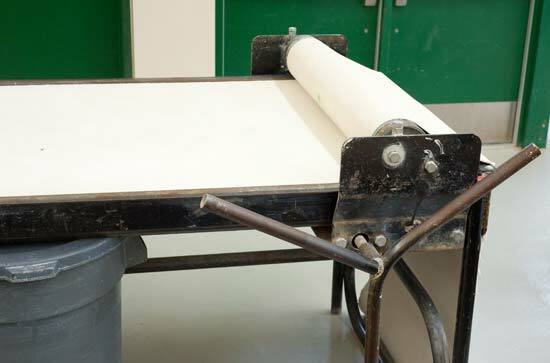 When backing the roller up, make sure the canvas does not wrap around the roller; if it does, and then another slab is made without fixing it, the slab will be thinner at one end and thicker at the other as the canvas unwraps. Stretching out clay in one direction more than another will make it similar to a wood plank, in that the clay's dimensions will change different amounts in different directions as it shrinks and is fired. This can lead to cracking, especially when working with larger slabs. Stretch clay out evenly to avoid the issue, or build large slabs using many smaller pieces of clay laid out on the roller table, that are then pressed together into a slab by the roller.